Tips to Prevent Train & Car Accidents in Indiana | Keller & Keller . Car-train collisions resulted in over 500 deaths and 6,000 injuries, according to the Federal Railroad Administration. Most of these accidents occurred at highway-rail grade crossings, where the road crosses the tracks on the same level. Unfortunately, Indiana was among the top states to experience these types of accidents. The state was ranked 4th in 2015 with 118 collisions. When it comes to car-train accidents, there is virtually no such thing as a small accident. The consequences of these collisions can be devastating to drivers, passengers, and their families. Why Are Indiana Railroad Accidents So Dangerous? Train accidents are especially dangerous due to the size, weight, and speed of the railroad cars. When an accident occurs, it is difficult to take any action to mitigate the damage. Car passengers and bystanders can do little to protect themselves, and car safety features for vehicle accidents cannot stand up to the force of a moving train. Experts compare the force of a 30-car train hitting a passenger vehicle to the force a car generates when hitting an aluminum soda can. In addition to the great force generated by trains, U.S. railways are common paths for the transportation of large amounts of hazardous material. When a crash occurs, this cargo can spill out and put all those nearby at risk. While these situations are rare, the consequences are extremely serious and the injuries sustained can affect accidents victims for a lifetime. Faulty safety equipment – This could include the flashing lights, warning sounds, or mechanical arm at the road crossing. Lack of safety equipment – Some crossings lack lights, warning sounds, a mechanical arm, or other safety features entirely. 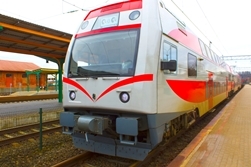 Conductor negligence – In many cases, the operator of the train fails to perform his duty properly, whether because he is under the influence, is fatigued, or for some other reason. Derailment – When a train leaves the track, it can leave a wide and devastating wake. With its heavy size and high speeds, a train will inflict serious injury to the people and property in its path. Mechanical failure – Many accidents are the result of some failure of the mechanical or electrical systems of the train, including brake defects, axle problems, and more. Who Can Be Held Responsible for Indiana Car-Train Crashes? Never stop on train tracks. If there is a red light before the tracks, stop at least 10 yards before the tracks so as to prevent becoming boxed in or trapped. Never assume that a train track is not in use. In many cases, a train-car collision will take place when a driver assumes that a track is unused or that trains only travel in one direction. However, train tracks use changes over time, and you should never assume a railroad track is not in use. Report railroad safety features that are not working properly. A significant number of train-car collisions take place when a railroad warming light or safety arm malfunctions. Look and listen for trains in both directions. Use all your senses to determine whether or not a track is clear of trains. Never try to beat a train across the tracks, or go around railroad safety arms. There is absolutely reason to take a deadly risk like trying to race a train across the tracks. Understand that trains are wider than train tracks. This is especially important to realize when stopping before or after a set of tracks. Leave extra room to ensure your safety. Watch for additional trains. In many cases, cars are hit by trains because they didn’t see a second train coming or didn’t realize that a train was coming in the opposite direction. If your injuries were the result of a car accident in Indiana that involved a train, we can help. Even if we're not able to accept your case, we can give you free answers and advise you on what steps to take next so that your claim is protected. Take a moment to fill out our online contact form to receive a prompt response from an experienced member of the Keller & Keller legal team. How Long Will My Injury Claim Take to Resolve?